Freedom Rockz: Amazing Lifelike Cake Decoration! Ekk Looks so Real! Amazing Lifelike Cake Decoration! Ekk Looks so Real! 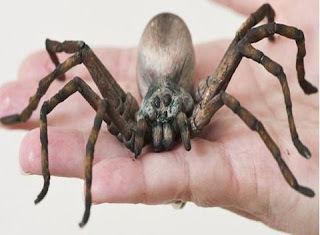 The 7in wide edible arachnid looks incredibly life-like but is actually made from sugar paste! Cake-maker Cecilia Chalmers was commissioned to make the scary decoration by Tyrone and Claire Jacques for the center piece for a horror-themed party. She definitely did not disappoint! This is an incredible piece of Cake Art! Wow she is really good! What is the most impressive cake decoration you have ever seen? I have never seen something in person this impressive but just by looking at the pictures this is amazingly lifelike!